In love with Formula 1: Monaco GP: First Ferrari win since 2001! After yesterday´s superb qualifying I had high hopes for today´s race. And I have to say that the red team didn´t let me down! Both red-suited warriors absolutely nailed the start. When the lights went out in sunny Monaco, Kimi took a fantastic start and held on to the lead. Sebastian was right at his teammate´s tail. The order of the top six remained unchanged, as Mercedes´ Bottas was third, followed by the Red Bull duo of Verstappen and Ricciardo in 4th and 5th, and Toro Rosso´s Sainz in 6th. Disappointed Hamilton, who had started from P13, was able to gain only one position at the start and he was 12th in the race. Already from the opening laps the red cars started to increase the gap to Bottas and the rest of the field. Renault´s Hulkenberg was the first driver to retire the Monaco GP. On lap 16 the German´s race was over with oil and smoke coming out of the rear of his Renault. The gap between the Ferrari drivers varied from DRS distance to 2 seconds, but Kimi seemed to be in control of the race. Bottas seemed unable to match Ferrari´s pace. Tyre degradation wasn´t an issue in the streets of the Principality. Verstappen was the first top driver to pit on lap 33 -for a fresh set of red-marked super soft tyres. The flying Dutchman started the pit stop roulette, as Bottas pitted a lap later and Kimi on lap 35. The tyre strategy was very similar; both Finns opted for the super soft compound as well. However, both Sebastian and Ricciardo stayed out banging excellent lap times. Kimi instead re-joined the track behind backmarkers Button and Wehrlein and lost valuable time. Ricciardo pitted on lap 39, opting for a similar tyre strategy to his teammate. And what a perfect strategy the Australian had! He re-joined the track in P3, so the Australian gained two positions due to his perfect pit stop strategy. Race leader Sebastian pitted a lap later, and what a turn the race had! Sebastian´s pit stop wasn´t perfect, but the German still re-joined the track ahead of teammate Kimi! Sebastian had done great job by setting fastest lap times at the right time, so the lead was his. After his pit stop Sebastian quickly started to build the gap to his teammate. By lap 50 Sebastian was already 10 seconds ahead of Kimi. I couldn´t help wondering, where Kimi´s excellent pace had suddenly disappeared. On lap 61 there was a nasty-looking incident at Portier. Button in his McLaren had tried to overtake Sauber´s Wehrlein, although there was no room for overtaking. Button crashed into Wehrlein´s Sauber, which ended up on its side against the wall. Safety car was deployed. Luckily Wehrlein himself was unharmed but it took a while, until the German was helped out of his car. During safety car Verstappen pitted for the second time; he opted for a fresh set of ultra soft tyres, aiming for an aggressive last stint. Also Wehrlein´s teammate Ericsson crashed into the wall behind the safety car. The Swede himself seemed to be puzzled, what had actually happened. 11 laps before the chequered flag safety car came in and the race was on. Ricciardo was really struggling on the cold tyres and just barely avoided hitting the wall. The Ferraris were out of reach, but Ricciardo, Bottas and Verstappen had a close battle for P3. Sebastian drove to the chequered flag as race winner, and Kimi made it a staggering 1-2 for Ferrari. This was the first Ferrari win in Monaco since 2001! Ricciardo completed the podium for Red Bull. It was significantly eye-catching, that there was no Mercedes driver on the podium this time! Bottas had to settle for P4, followed by Red Bull´s Verstappen in 5th. Not even the fresh tyres helped Verstappen to challenge Bottas and teammate Ricciardo for the last podium place. Sainz finished impressive 6th; P7 was the maximum for Hamilton today. It was overwhelming to see both Ferrari drivers on the podium, although I couldn´t help noticing how disappointed Kimi looked after losing the victory to his teammate due to the pit stop strategy. There has already been a lot of talk about "conspiracy theories", that Ferrari arranged Sebastian to win. I don´t believe in these theories. Kimi was unlucky to get stuck in the traffic after his pit stop, which allowed Sebastian to benefit from the fastest lap times. Usually the first driver to pit benefits from the undercut, but this wasn´t the case today. Sebastian now has a very promising 25-point lead in the drivers´ championship standings. Ferrari also made it ahead of their title rival Mercedes in the constructors´ standings by 17 points. 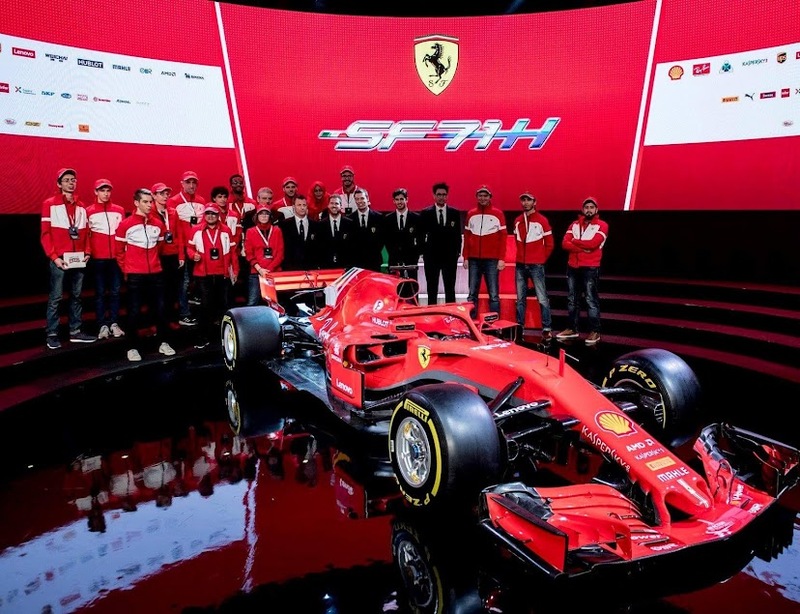 To me it really seems, that the pecking order has turned around; Ferrari now seems to have the upper hand in terms of pace and performance!